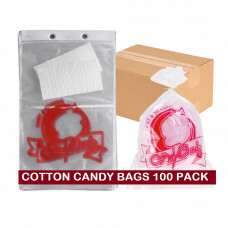 Cotton Candy Floss Sugar Bags These poly-bags are ideal for pre-packaging cotton candy and the attractive graphics are sure to attract sales. These are the same bags used at all fairs theater and amusement parks. Printed fun graphics and easy to use tear off design. 100 per carton. Bag Size: "20 x 12"